Understanding all aspects of renewable energy is important. Read this post on thermoelectric energy, also known as the “Seebeck effect,” by Dr Harry Zervos, Senior Technology Analyst, IDTechEx. All financial projections for the market come from IDTechEx. Wireless sensor networks are already beginning to adopt energy harvesting technologies, with industrial applications being at the forefront in this space. System integrators offering condition monitoring solutions in the process industry are adding energy harvesting-powered wireless sensors into their product portfolio, due to customer demand for wireless capability without the need for replacing batteries. 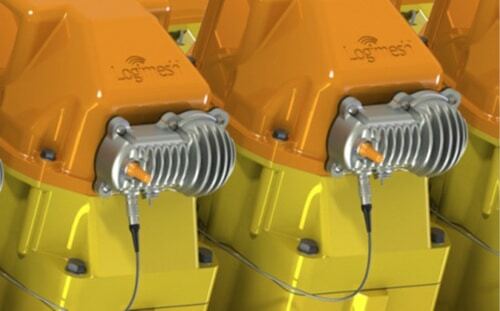 Examples include the Logimote from Logimesh; small sensor nodes that can be mount directly onto internal combustion engines commonly used on well drilling rigs and natural gas compression packages using temperature differences between the engine and ambient air in order to generate power. The device features fully integrated thermoelectric generators and power management as well as standard thermowell or surface-mount installation. It uses intrinsic process heat to power the full device (indicative required temperature difference Î”T = 30 K). In terms of data transmission, the device uses the wireless HART 7 communication protocol (2,4 GHz). It further ensures forward compatibility due to WirelessHART as well as secure data transfer. The installation pictured above is for Robinson Brothers, a speciality chemicals manufacturer in the UK that uses wireless sensors powered by energy harvesting to measure the temperature of their central heat distribution network (steam or oil) at certain points and transmit measurement values to office buildings without the need for wiring inside the process building. The device was installed in November 2012 and since that time it is powered permanently by process temperature as it is high enough to get a 100 percent power supply from TEGs. Although the WSN segment is expected to initially grow slowly, as can be seen in the graph below, it is going to account for over a third of the overall market for thermoelectric harvesters by 2023. Non-WSN applications in the industrial sector will also see initially conservative growth but will account for almost a quarter of the market by 2023. An interesting application in this space is a concept proposed by Marlow Industries, the patent pending EverGen TEG Plate Exchanger that combines thermoelectric power generation with the high heat transfer rates, scalability and compactness of traditional plate exchanger technology. Electrical output ranges from single watts to kilowatts, depending on size and application needs. Gross volumetric power density can approach 1kW/ft3 for large systems, depending on the temperature differential available. This and other devices in industrial environments, such as steel foundries, combined heat and power plants or even applications such as hybrid solar thermal systems, are just some of the main markets that will be absorbing a large share of thermoelectric harvesters of varied shapes, sizes and performance characteristics. For more information on the industrial sectors uptake of thermoelectric harvesters and for further details on other market segments such as consumer electronics and electrics, military and aerospace applications, as well as complete market forecast and segment penetration for the next decade, please visit here.